Learn how to inline skate (rollerblade) with skilled and experienced instructors at Robichon’s Skate Ventures. With guidance from our qualified skate instructors, begin to experience the fun and adventurous world of inline skating. Skate Ventures instructs individuals of all ages, abilities and backgrounds in a variety of forms; such as, group classes and camps. Skate Ventures hosts programs or we create programs with partners to be held in their location. Skate 4 Sarah FREE basic inline skate lesson (with optional Operation Smile donation). During Skate for Sarah’s free skate lessons, you will learn the basics of inline skating; including: balance, safety techniques, equipment orientation, how to get moving and how to begin to use that heel brake! Guided practice time is included. Skate for Sarah is perfect for the new skater and those struggling to stop on inline or quad skates. Rental skates are available at a reduced fee. Group Lessons Enjoy learning new skills with a professional skate instructor and a fun group of people like yourself. In our group lessons you will develop skills and confidence with a cohort seeking to enjoy the fun and freedom skating has to offer. The lessons follow our recreation curriculum progression. Group Lessons are limited to 7 to 10 participants. The group lesson schedule can be found on our calendar. Skate Camps – Our skate camps are weekday or weekend camps. The weekday camps run from 9 to 12 PM Monday through Friday. The weekend camps run 9 to 11:30 AM Saturday and Sunday. Robichons Skate Ventures hosts the camps in Minneapolis or we are hired to run camps all over the nation. The camps following our standard lesson progression. Private Lessons – Private lessons are offered to individuals or private groups. The benefit of private instruction is customized instruction designed to address the student’s specific desires and needs. Practice skate drills designed to build balance on skates (inline or roller). Beginner Level, Intermediate Levels. Learn to skate backwards. You only need to feel ready to turn from front to back and back to front with beginner two-step turns. We will teach you how to skate backward with ease, step-by-step. Every step of the way we hold your hands ensuring your emotional comfort and physical success. Intermediate Skill Level. learn braking techniques using skill and wheels rather than your brake. Advanced beginner level and up. Learn how to maintain the physical components of your skates. Topics include general cleaning, wheel rotation and bearing maintenance. Learn to take your swizzles to the next level. Work on cross-over swizzles through cones both forward and backward (optional). Also, Learn to skate through cones on one skate. Benefits skaters crossover and edge management capabilities. Advanced Beginner Level. Learn forward crossovers in a palatable sequence. The forward crossover will be broken down into sections, reinforced with supervised exercises to ensure your success. Now is your chance to learn the pieces of a fantastic crossover. Intermediate Skill Level. Optimize your instruction in a one-on-one lesson or get a group of friends and family to enjoy learning inline skating, together. 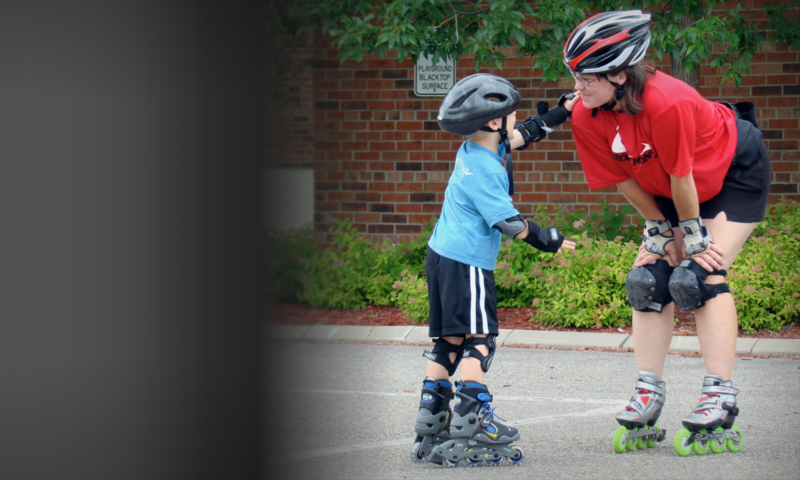 Private Lessons with Skate Ventures provide customized individual attention. The pace is set to match the needs and desires of the private student. We strive to schedule private lessons at a location and time that is convenient and suited for you. Some times travel fees apply.